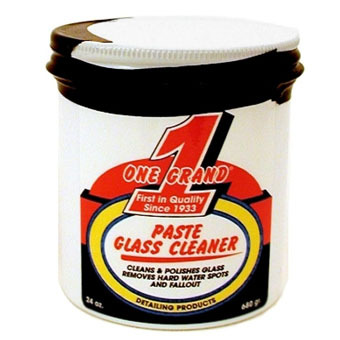 A thick paste glass cleaner developed specifically to remove mineral deposits and water spots from automotive exterior glass. Apply with a damp sponge, work thoroughly into the glass with moderate pressure until there is nothing but a faint haze remaining and allow to dry. Wipe off the slight powder residue with a Micro-Maize Microfiber Glass Cloth or soft 100% cotton flannel cloth. Turn the cloth over and buff to a sparkling clean, crystal clear finish. DO NOT use on Plexiglas, plastic or on the tinted side of aftermarket tinted windows.